US military veterans are being sent on all-expenses paid trips to Washington on the Saudi government’s dime to lobby against the Justice Against Sponsors of Terrorism Act (JASTA) that allows victims of 9/11 to sue foreign governments, the New York Post reports. A number of veterans have told the New York Post that they were horrified to discover they were part of a ploy to pressure Washington to prevent justice for the families of the victims of 9/11. According to the vets, Saudi Arabia solicits them through an intermediary to go on an all-expenses paid trips to Washington so that they can pressure lawmakers to amend the Justice Against Sponsors of Terrorism Act (JASTA). The four day trips include airfare, food and drinks, and accommodation at none other than the Trump International Hotel. Qorvis MSLGROUP, one of the largest PR firms in the world, organizes the Washington visits, but doesn’t mention that the Saudi Arabian government is funding the operation. Qorvis MSLGROUP has counted the Kingdom as a client since 2001. The money trail tying the Saudis to the journeys is obscured through the use of foreign agents, 75 in total, as compiled by 28pages and reported in the Post, yet the PR firm tells the vets that there is no Saudi involvement in these trips. Veterans are lured by lobbyists posing as veteran advocates and told that JASTA puts them at risk of “retaliatory lawsuits” from foreign countries, in an effort to scare the military men and women into advocating against the Act. JASTA, also known as House Resolution 3815, was passed in September, after years of delays and in spite of president Obama’s veto. 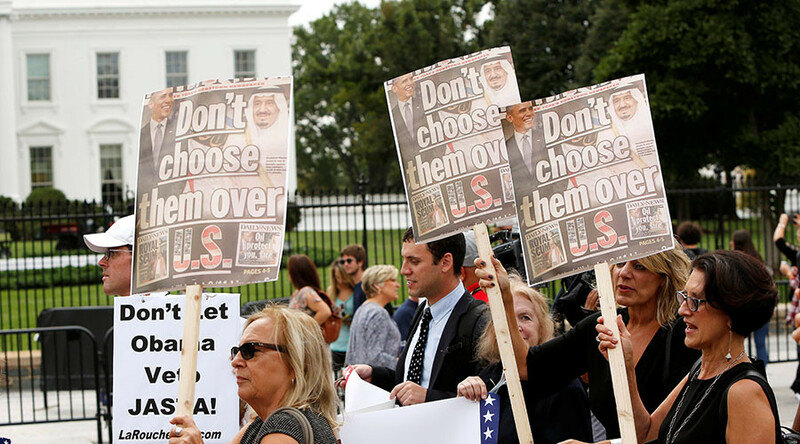 The amendment will likely provide legal cover for the Saudis, despite years of accusations that wealthy Saudis, including the royals have funded terrorist groups. The veterans have expressed disgust that they have been used to further the Saudi agenda. “I joined the Marine Corps as a direct result of 9/11, so to be wined and dined by the very people I joined to fight against, that was sickening,” Marine sergeant and Iraq war veteran Timothy Cord said. “The organizers were definitely keeping stuff from us,” he said, explaining that the vets were told that if any of them travelled to Afghanistan, Iraq and Saudi Arabia, they could be arrested as terrorists under JASTA. According to Cord, trip leader Jason E Johns flatly denied any ties to the Saudi government. “He stood up the first night to announce that ‘there are rumors going around about Saudi involvement, and they absolutely aren’t [involved].’” he told the Post. Johns says he is president of the No Man Left Behind Veterans Advocacy Group, but federal records show he was paid $100,000 by Qorvis on behalf of the Kingdom of Saudi Arabia to conduct outreach against the act. Qorvis MSLGROUP denies any wrongdoing. “My understanding is everything is fully above board and everyone is fully informed of the issues,” Qorvis Managing Director Michael Petruzzello said. Saudi Arabia adamantly denies funding terrorism and allegations of its role in the 9/11 attacks. Fifteen of the 19 suspected 9/11 hijackers were from Saudi Arabia. One of the hijackers, Zacarias Moussaoui even claimed members of the royal family were listed on an al-Qaeda database he worked with.